It’s rather inevitable that at least one media outlet would have screwed up a bit of the tyrannosaurs scavenging story. Inevitably some thought that ‘one tyrannosaur scavenged once’ meant ‘all tyrannosaurs were exclusively scavengers’. Despite this not appearing in the paper, or the coverage that it was lifted from. Indeed, both being quite explicit that this was not the case. The new paper might show that say, Tyrannosaurus was a good predator, but this does not mean that it was not a scavenger. Biological systems are complex and few things operate in one way alone. Unless the researchers have done the work to test that the other possibilities are false, don’t assume that evidence for X rules out the other possibilities. We can hold things with our hands, but we also signal with them, and use them to make tools, and to help us feed, and climb etc. So having covered the fact that tyrannosaurs were both predators and scavengers in yesterday’s post, we can now talk about how they were feeding. 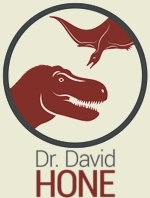 Previous records of feeding by large tyrannosaurs have tended to show a pretty rough approach – bite bites going deep into the bones which are sometimes part-dragged out leaving scores in the bone. This is no great surprise, they have big and robust teeth, and huge skulls with a lot of muscle power behind them and a powerful bite. It makes sense that they can be quite careless as it were in their approach – when you have a bite that can break pretty much anything open then go ahead and bite. 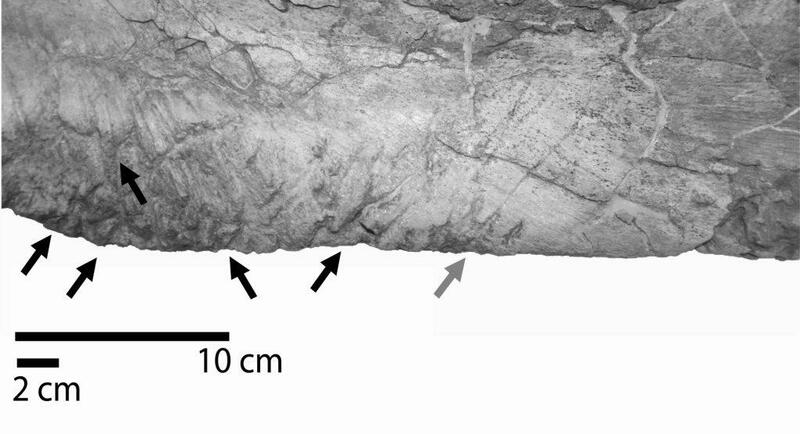 Tyrannosaur scrape marks left in a Saurolophus humerus. From Hone & Watable, in press. 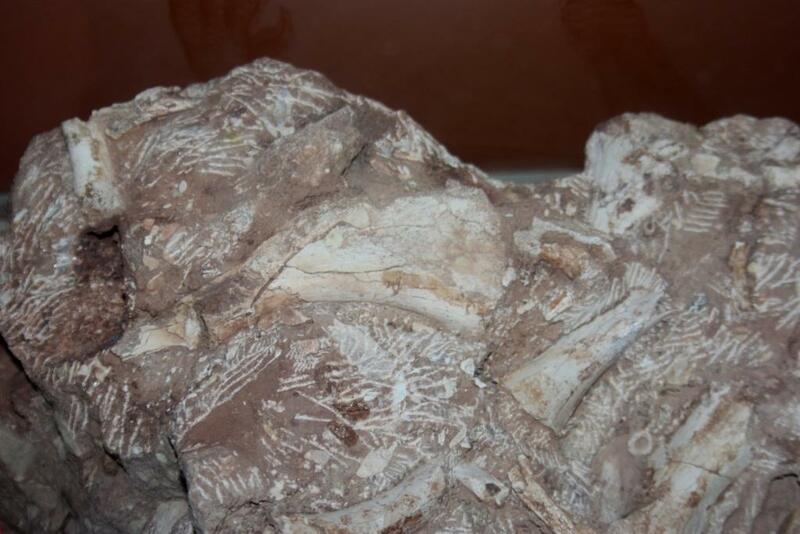 This is however, not what we see here with the Saurolophus specimen. The humerus has suffered a large number of bites, but most of them are shallow, not big deep gouges. What’s more the marks are far from randomly distributed across the specimen. 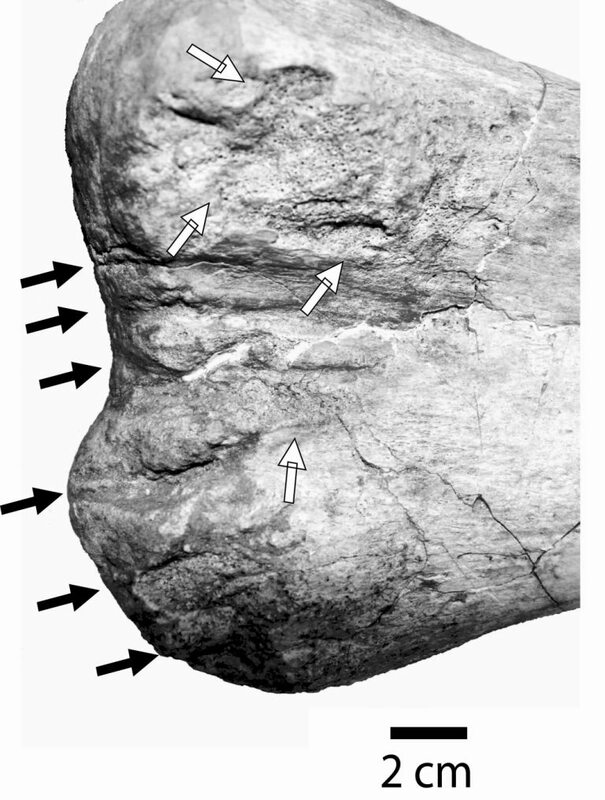 There are some relatively big and deep bites at the ends of the bone, but along the low and flat deltopectoral crest (where the main muscles would attach) the marks are shallow and clearly made by teeth being dragged across the surface of the bone. It’s worth noting that the deep bites at the end were heavy enough that if they have been performed on the DP crest then this would have broken. In short, the animal was being relatively careful here when it was not at the ends. Deep bites by a tyrannosaur on a Saurolophus humerus. From Hone & Watabe, in press. What this shows therefore is that the tyrannosaur was making an active choice in how it fed on the bone. It chose to make heavy bites deep into the bone ends, but deliberately did not do this on the deltopectoral crest even though it could have done so. Tyrannosaurs did not just rip apart carcasses and crunch through bones even though they could. Sure on some occasions they did, but not always. They could, and did, chose how to feed and could be relatively delicate. 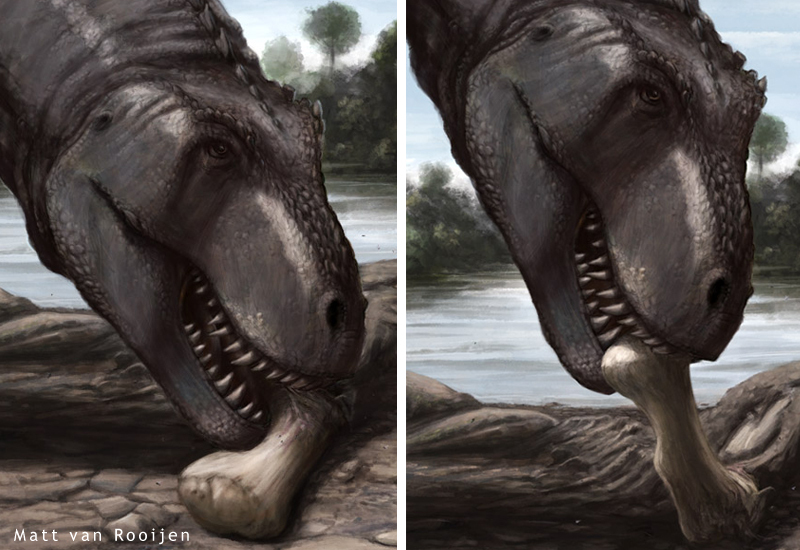 Differing feeding styles by Tarbosaurus. Image courtesy of Matt van Rooijen. Why the different styles? Well the deep bites might have been to try and get to the cartilage on the bone to eat it, but might also have been to simply free the bone from the rest of the skeleton to make feeding easier. This is supported by the fact that the marks on the DO crest are on both sides but at different angles to each other. The different angles means that they were not made by the top and bottom teeth together in unison. 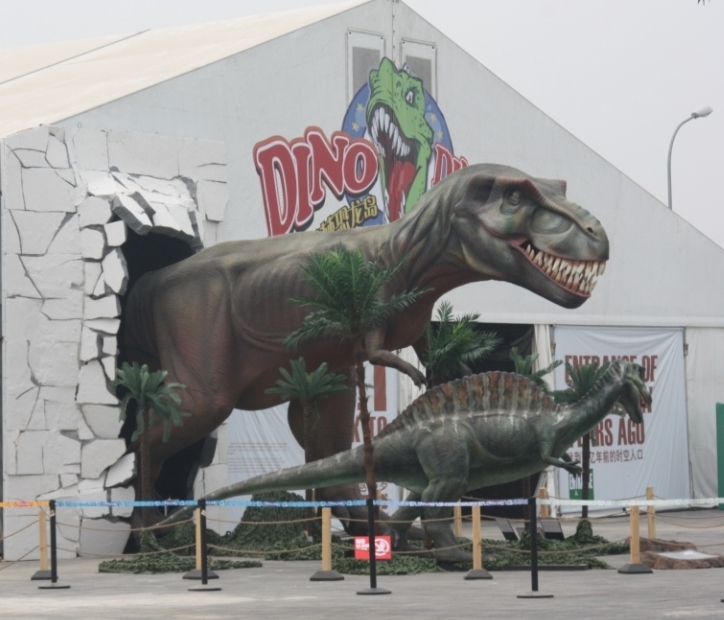 That also means that the bone must have been turned over at some point for the Tarbosaurus to get to the other side, and thus the fact that freeing the bone from the rest of the body would have assisted feeding. This specimen does then give us rather greater depth to our understanding of tyrannosaur behaviour both in terms of the practice of scavenging and in how they dealt with carcasses. This shows a surprisingly delicate touch by a 10 m and 6 ton* reptile. * Note – vague, but probably not inaccurate estimate. Artwork courtesy of Matt van Rooijen over at the Optimistic Painter. More superb work I have to thank him for. 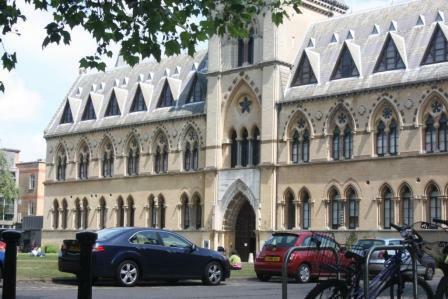 The Reverend William Buckland is a significant figure in the history of archosaur science having been the person to describe Megalosaurus (one of the first dinosaurs to be named) and Dimorphodon (one of the first pterosaurs). His title obviously refers to his career as a priest, though in a way it’s odd he is remembered only as ‘Reverend’ since he could easily be recalled as ‘Dr’, ‘Professor’ or ‘Dean’. Despite being largely a biblical literalist, Buckland did much significant work on geology and palaeontology in the UK in the 1800’s and produced important descriptions of many taxa and geological sections. At a time when the new science of ‘undergroundology’ (yes, really) was still working out what it should do and how and what much of it might mean, Buckland was a key protagonist and his influence was substantial. While I can hardly call him a ‘hero’ his contribution to science and especially the groups on which I work cannot be ignored. 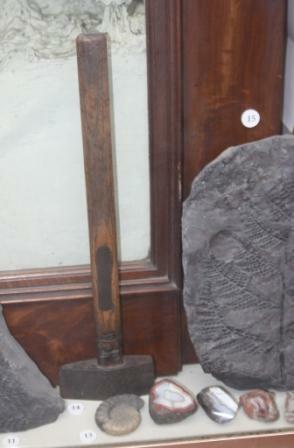 Thus I was pleased to see various things associated with his work and career at the Oxford museum including his geological hammer (above) and some small parts of his extensive personal collection of specimens. 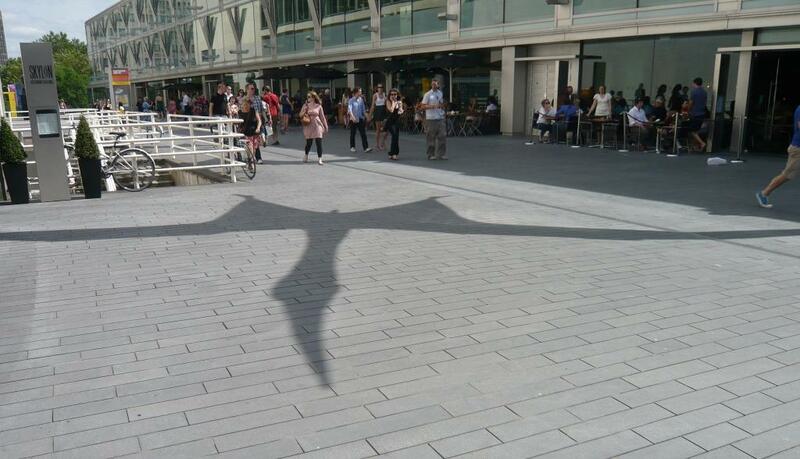 Well the great pterosaur invasion of London is at an end. 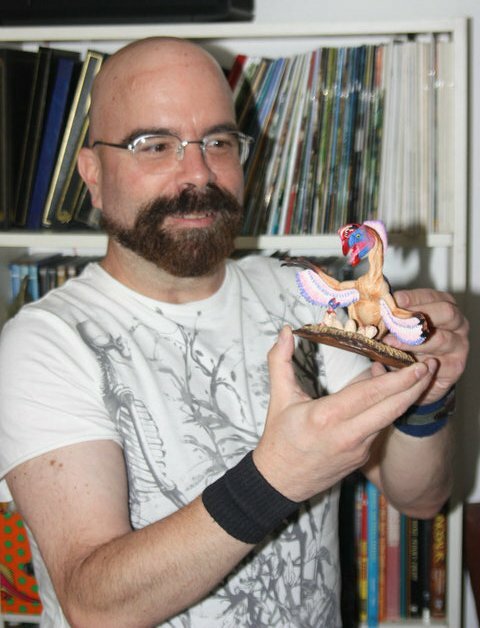 However, the good news is that Darren Naish has a big write-up over on his blog with more to come from Mark Witton at some point, likely on the Pterosaur.net blog. Here are a couple of quick pictures though to tide you over which come from my parents as tragically I was trapped in Beijing and missed the whole thing despite having been in the UK just 2 weeks ago and returning tomorrow. 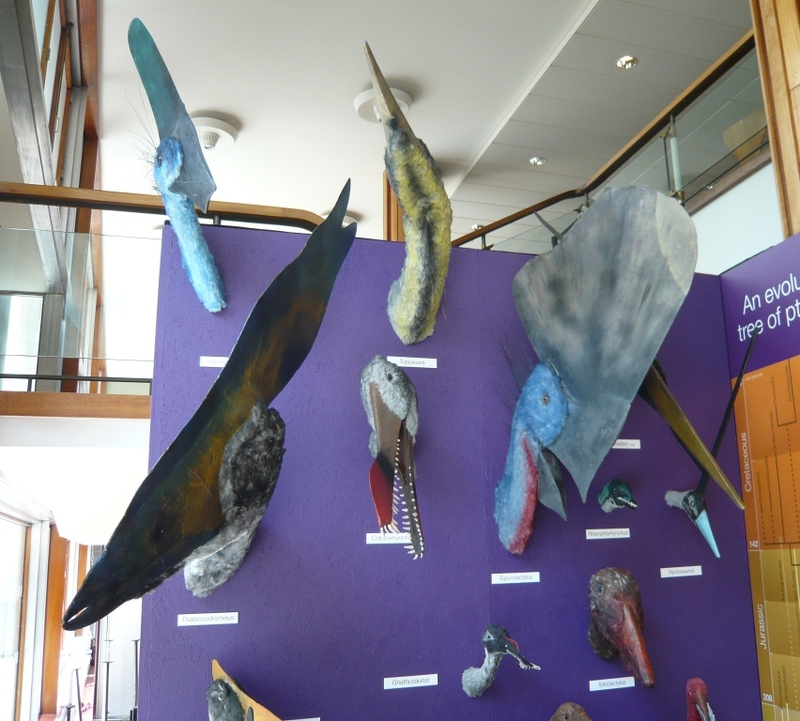 So having been involved in several palaeoart projects of various kinds in various ways of late, it seemed sensible that I put fingers to keyboard and try to come up with something useful. I should stress that of course I know and work with a number of full time palaeoart people in various ways and I’m certainly not trying to teach Luis Rey, Mark Hallett or Bob Nicholls how to do their jobs! But there do seem to be many an aspiring palaeoartist out there and there seem to be some common enough errors or misconceptions out there that are worth flagging up to save them being made or corrected. This will be, I hope, a bit of a starter pack and just generally handy for those trying to draw dinosaurs or other extinct critters. Whatever your style or methods the point is (I assume) to produce a piece that as accurately as possible reproduces what the animal did, or could, have looked like. 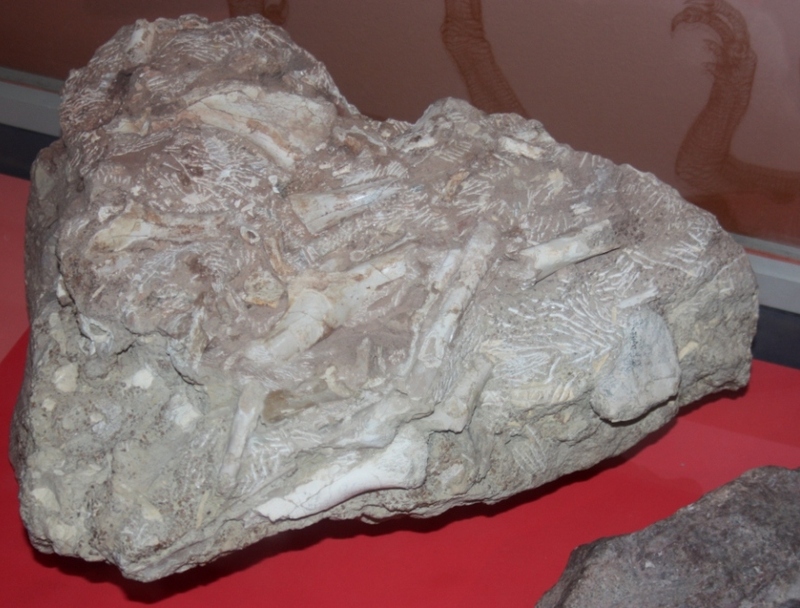 Very often the fossils that are seen on display in museums or in papers are beautifully clear of surrounding rock, or are carefully exposed on a slab or block of matrix. When TV shows want to cover fossil preparation we see something rapidly fall out of sandstone, or delicate cleaning of the last bits of rock from a specimen. What they don’t tend to show, and what you won’t see from a complete preparation job is how hard it may have been to get there. Here are some blocks of material from the UK that contain various bits of the early saurischian Thecodontosaurus. What you can hopefully see if that the matrix in an ungodly conglomerate whose defining feature is just how tough the stuff is. I did some work on this many year ago and it could take hours to expose even just the end of a bone. Rock would flake off in only the smallest amounts (and you can see the endless white scorelines across the surface in the photos) so it took huge effort to take out even a few cubic centimeters of rock. We had a few tons of material in the lab. I don’t think the work of preparators is under appreciated by palaeontologists or those who just generally like fossils. Without them we would often have fewer nice specimens to work on, and their experience and knowledge can be invaluable in the field and in research. However what might not be appreciated is just how much work can go into the job. In this case it took me something like 5 hours of work to expose the end of a small croc femur about 5 mm long. It should therefore be clear just how much work went into preparing the dozens (perhaps by now hundreds) of elements that have come from this quarry. I guess all I can really say at this point is “thanks”. The great biologist J.B.S. 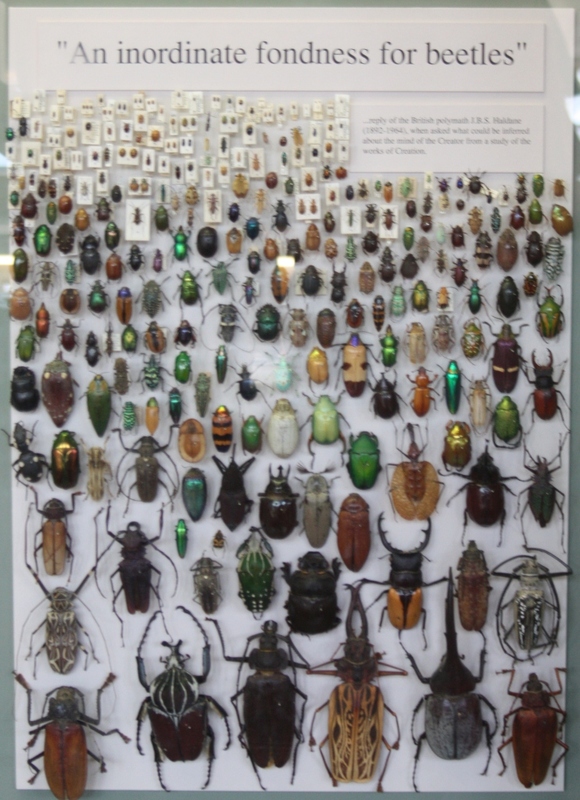 Haldane gave the world some memorable quotes on diversity and evolution but rabbits aside, it is his quote about beetles that must have lived longest. For those who don’t know, he was fielding a question about what biology could tell us about a Creator and replied that he must have an inordinate fondness for beetles. 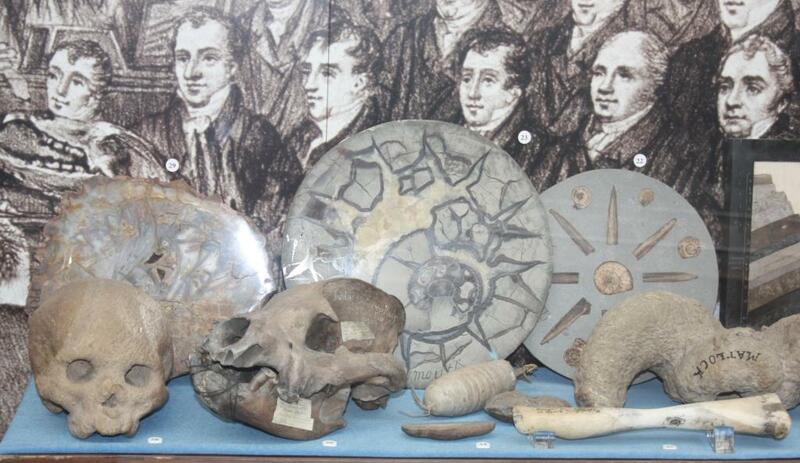 Which leads me to this little exhibit from the Oxford museum which I found quite charming. I do so like clever little displays that can say much in minimal space. In a space not much bigger than a piece of A4 paper this posits a famous quote by a famous biologist (a nice bit of history there), explains the reasoning behind it (namely the colossal diversity of beetles and their incredibly varied ecology and lifestyles) and provides a huge mess of specimens to demonstrate that diversity in colour, shape, size etc. This gives a huge opportunity for people to really compare and contrast much about related forms (even with this level of diversity) and to get across a much under appreciated point. Simple but brilliant. It appears that comments were turned off on several posts for no obvious reason. I assume this was due to the problems I was having with WordPress with endless reloads of some posts etc. These have now been fixed and opened up again. Apologies to anyone who wanted to post but could not. On a very different note, I realised that a couple of weeks back I passed my 2 year anniversary of blogging on WP, and the 3 year anniversary of blogging in total is up in September. Wow, time flies.